BERLIN, Germany, September 29, 2014 (ENS) – The German government has approved a new law on electromobility, including incentives for EV drivers such as parking privileges, use of bus lanes and special transit access. But environmentalists are not happy with the new law, EurActiv Germany reports. Green-lighted by the German federal cabinet on Wednesday, the measure is expected to take effect in early 2015 and expire on June 30, 2030. It covers battery powered vehicles, externally chargeable hybrid cars and fuel cell vehicles. “We are creating additional incentives for electromobility,” explained German Transportation Minister Alexander Dobrindt. “In the future, municipalities will be able to choose how to locally promote the use of electric cars, such as offering free parking or special transit rights,” he said. For plug-in hybrids, carbon dioxide emissions are capped at 50g per kilometer or a minimum of a 30 kilometer (20 mile) range on purely electric power. Starting in 2018, a 40 km range will be the standard for hybrids. This established minimum range is expected to cover short everyday journeys. Under the new law, EVs approved in Germany will receive special identification on their numbered license plates. Electric cars approved outside the country also will receive benefits. Because they cannot receive a German license plate, the legislation says they will be identified by a special sticker. The law gives municipalities the power to reserve parking spaces at charging stations for electric vehicles and to provide free parking. Local authorities can dole out special access and transit passes – in areas sensitive to air or noise pollution – and open bus lanes for labeled EVs, when conditions allow. Final decisions are in the hands of traffic control authorities. “In addition, electric vehicles will be identifiable to anyone at a glance thanks to individual labelling. Because of the growing selection of e-models on the market, and the growing number of e-cars on the roads, sales will continue to rise,” Dobrindt said. The auto industry welcomed the new measure. 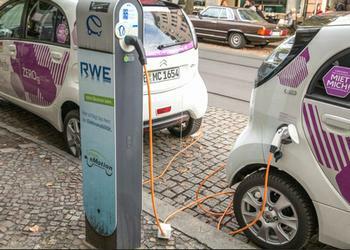 The German Automobile Industry Association (VDA) said it expects a boost for electromobility. “Through individual identification for e-models, these vehicles will be more visible in traffic. Opening up bus lanes and offering free parking areas make driving electric-powered cars more attractive,” said VDA President Matthias Wissmann. By the end of the year, 17 production models made in Germany will be released to the market. Twelve more will follow in 2015. The German Transport Forum (DVF), a multi-modal industry association, also welcomed the new legislation. But the Greens are critical of the new law. Stephan Kühn, transportation spokesman from the Bundestag’s Green Party faction, said Transport Minister Dobrindt does not “to any degree” meet the electromobility challenge. “He is doing too little and going about it the wrong way. As a priority, he is promoting heavy off-road and sports utility vehicles with German-produced electric motors. This is not the way to reduce fuels that are harmful to the environment. What is needed, is a universal approach for all modes of transportation in concert with an expansion of renewables,” said Kühn. The Nature And Biodiversity Conservation Union (NABU) also criticized the new measure. “Opening access to bus lanes for electric cars and plug-in hybrids attests to the huge lack of knowledge over the real state of mobility in cities,” said NABU’s national managing director Leif Miller. “A growing number of cyclists are already forced to share the narrow lane with buses. According to the government’s intentions, a Porsche Cayenne with an electric power range of 30 km will be allowed drive in these bus lanes,” he pointed out. Miller said he does not see this as contributing to the acceptance of electromobility in cities.